A typical indian meal starts with traditionally-flavoured soups like tomato soup . Healthy and colourful spinach is combined with low fat milk and flavoured with garlic and chillies. Milk makes the soup aesthetically mild and well-flavoured while pepper and green chillies spice up an otherwise simple soup,while a dash of mint adds a refereshing touch. 1.Boil 2 cups of water in a deep pan, add the spinach and cook for 3 to 4 minutes and keep aside and allow to cool. 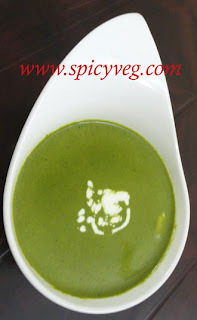 2.When cool, add the mint leaves and green chillies and blend in a mixer to a smooth purée. 3.Transfer it into a pan, add the milk and bring to boil. 4.Add the salt and pepper and mix well. 5.For the tempering, heat the butterin a small pan, add the garlic and sauté over a medium flame till it turns golden brown in colour, while stirring continuously. 6.Add this tempering to the spinach mixture. Mix well and simmer for another 2 to 3 minutes. 7.Serve hot garnished with fresh cream.